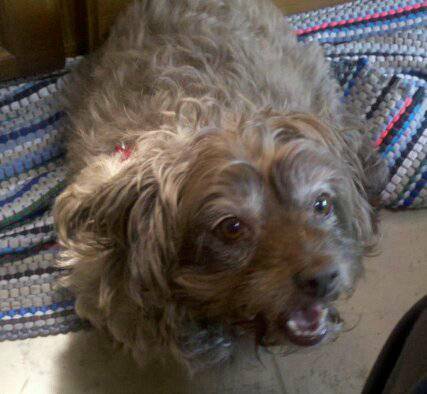 Toffee is an older (9+ years) brown terrier/poodle mix with curly/wiry mixed fur. Her coat is longer, like in the first pic and she has some silver/gray fur, especially around her muzzle, eyes, hind legs. She has golden eyes and weighs about 20 pounds. She is SUPER friendly and will go up to anyone. She got out our patio door and I didn't realize she had run off for awhile and by then she was gone. She went missing on Saturday, July 11 in the afternoon, but I am not sure what time. I think she was probably picked up by one of the trash dumpsters in the Gramercy/Mohawk Hills apartments, as this is where I have found her when she has run off in the past. She loves to take off out of any open door, but she usually comes right back, which is why I think she got picked up by someone. My other dog (the white one) did not run off, and she misses her buddy, as does my little boy. She is microchipped but won't keep a collar on so she didn't have any tags on. She is also posted on Indy Lost Pet Alert.